The circle of fifths is the most powerful chord sequence in Western harmony. You cannot study popular music harmony for long without learning about it. You will recognise it when you hear it, and once you know about it, you will hear it in music all the time. 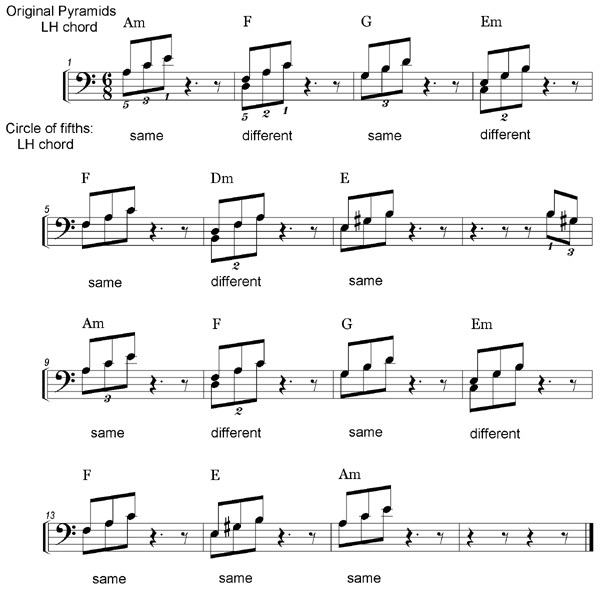 Here's an audio performance of Pyramids with circle-of-fifths chord changes. Here is the scrolling MS module video performance. The Pyramids bass line can easily be adapted to show the circle of fifths in action by lowering every other note an additional third. Look at the bass line of Pyramids as we have played it so far. This is the zigzag line of bass notes you have seen in many diagrams. The bass note falls a third then rises a second. Nine of the thirteen chord changes in Pyramids (underlined in the example above) follow this pattern. Now compare the new circle of fifths bass line. Instead of falling a third then rising a second, the bass note now falls a fifth or rises a fourth. (Falling a fifth and rising a fourth both get you to a note of the same name.) All but one of the chord changes follow the new pattern. To adapt the Pyramids left hand part to show the circle of fifths, we only need to change five bass notes in a 16-bar A1A2 version. The next music example shows the ‘old’ left hand version with the stems up, plus the ‘new’ circle of fifths version with the stems down, both on the same stave. You will play stems-down notes to create the new version. Notice the five bars that are different. At this point, using the down-stem music above for the left hand, and any right hand Pyramids music, you could play a 16-bar A1A2 version Pyramids which incorporates the circle of fifths. Here are the first four bars of a simple-melody circle of fifths version. Try to complete it, comparing how it sounds to the original version. Of course, if we change the bottom note of a left hand Pyramids chord, we will have changed the root, and therefore the chord will have a new name. These new chords are called seventh chords. Here are all the seventh chords in the Pyramids circle of fifths version. The shaded diamond marks the old root. You already know major and minor seventh chords from the 'B section'. 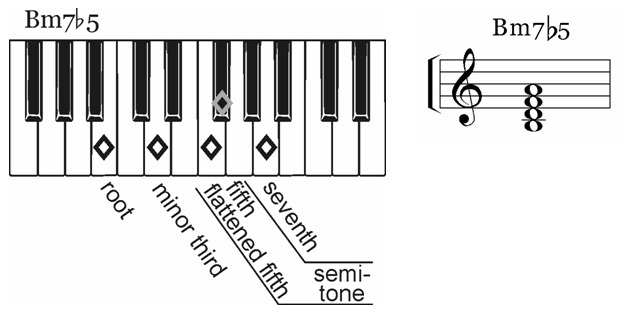 The Bm7ë5 (B minor seven flat five) chord is the only new type of chord here. It looks like a D minor chord with B in the bass. It’s easy to over-use the circle of fifths. For practice, play the Pyramids version on page 116 of the Workbook, which uses all the possible circle of fifths chords. 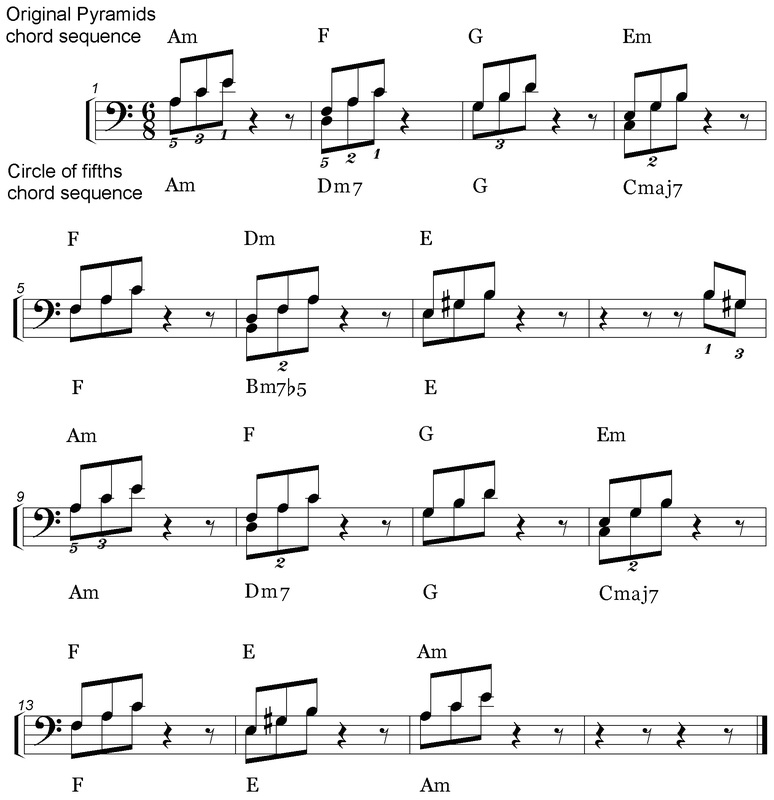 Then play the versions shown in the chord charts on this page, which use only some of the possible circle of fifths chords. In a way, versions with fewer circle of fifths chords sound more sophisticated than ones that use every possible circle of fifths chord. A 32-bar AABA version incorporating the circle of fifths might look like this. Now go on to the Suspensions module.